Ansonia Clock Company, crystal regulator, "Elysian", C. 1914. A nice size clock standing 16.5" high, 4 large beveled glasses decorated on all sides with the cast ornaments on the edges, top, and base. 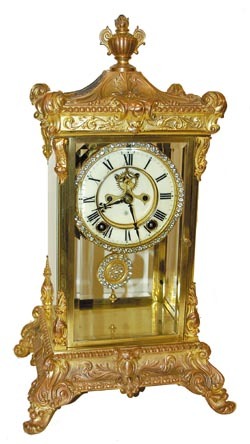 The clock has the million dollar look with the jeweled sash and pendulum and all jewels present and accounted for. The case was devalued considerably when someone had nothing better to do than polish 75% of the rich gold finish down to the copper undercoat. It would be fine for most people but the perfectionist collector would have to have it regilded. 8 day movement is running, strikes the half hours and hours on a hanging gong. 2 piece porcelain dial with open escape is very good. There may be a faint hairline somewhere, there usually is. A good clean decorator clock. Ly-Ansonia #360.